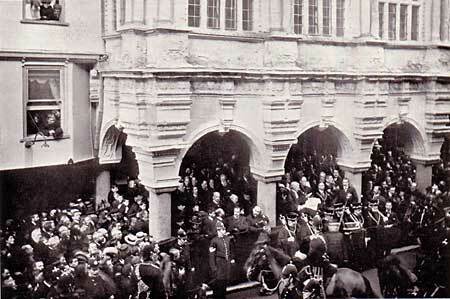 The proclamation of King George V was made at the Guildhall in May 1910. A large crowd turned out to hear the Mayor read the proclamation for the new King. In former times, the Mayor and Alderman, dressed in their scarlet gowns and robes, would proclaim a new monarch outside the Guildhall, New Inn, Bear Inn, St John's Bow and the Carfax. 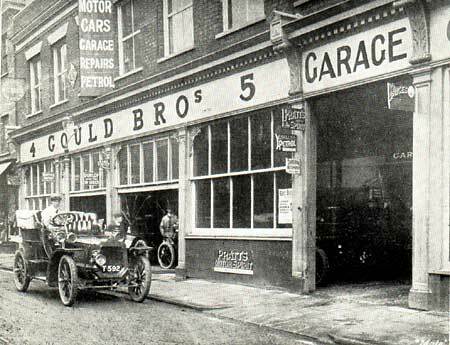 Gould Brothers were one of the first motor dealers in Exeter. 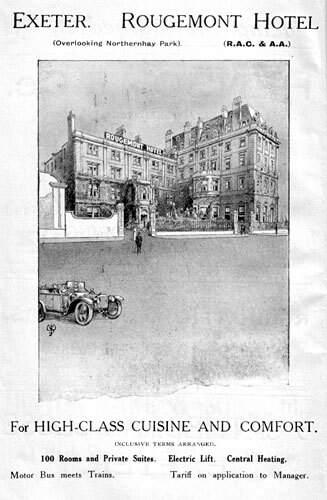 They had showrooms near the New London Hotel, and a workshop in Southernhay. 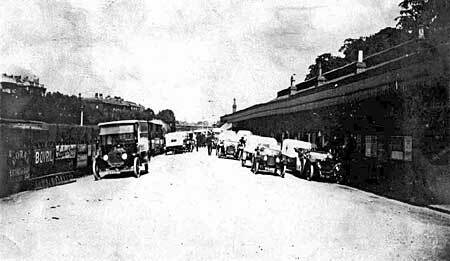 Sidwell Street and New North Road were popular areas for motor garages with Maudes, Standfield & White, Cox Brothers and Reid & Lee all within a couple of hundred yards of each other within a few years.This photo dates to about 1914. 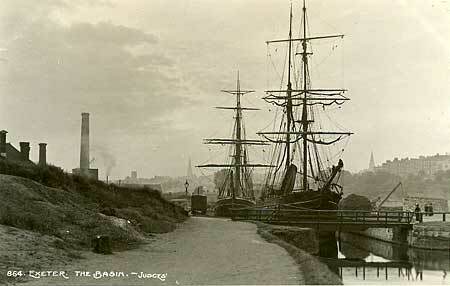 A view past Kings Arms Sluice towards the Canal Basin. Two ships appear to be waiting to leave the basin. The chimney on the left is the electricity generating station. The church on the horizon in the centre left, is St Michael's Mount Dinham, while that on the right is St Mary Major. Greenslades , the coach company was founded by two brothers in 1912 at Bradninch. This hotel occupied the same site as Deller's, until 1912 when Lloyds Bank was built. The Half Moon dated from 1680/90 as a coaching inn. In 1912, there were 225 private cars registered in Exeter. The day war was declared, on 4 August 1914, a large crowd gathered in Bedford Circus. 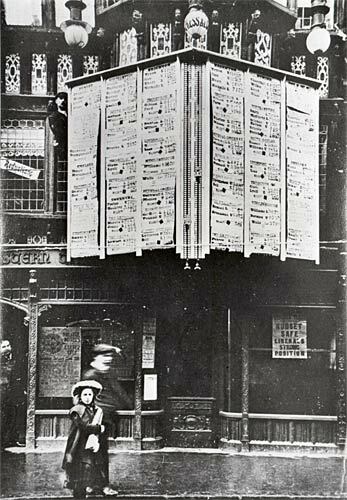 The Western Times office at 226 High Street would post the telegraphed General Election results on these two boards on the High Street. Careful inspection of the original photo shows that the results are for the 1910 election, one of which for Dundee shows Winston Churchill as a Liberal candidate returned to Westminster. Exeter elected Harold St Maur, a Liberal candidate. Maybe Peter Snow borrowed some of his election graphics from Exeter! Courtesy of the Express and Echo. 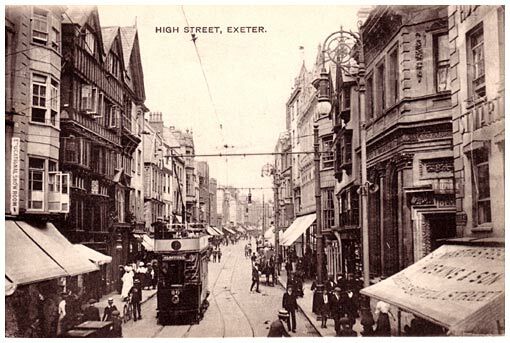 Marks and Spencer opened its first store in Exeter in 1912 at the top of Queen Street. 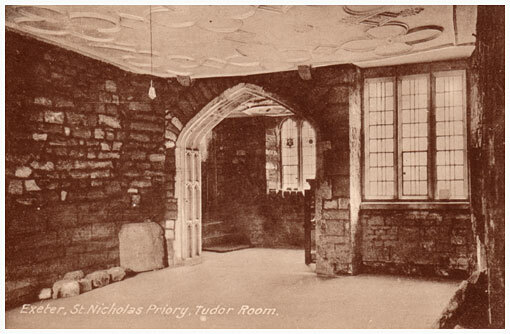 The interior of St Nicholas Priory - Exeter Corporation purchased the priory from the Wilcocks family in 1913 and opened it as a museum three years later. 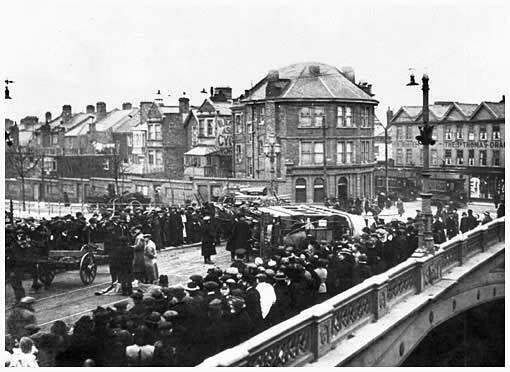 "the introduction of motor cars and a system of electric tramways in Exeter. The tramways caused a considerable reduction in the number of cabs plying for hire......and subsequently a loss of trade to the debtor, who did the shoeing of the horses". Exeter City Football Club played the Brazil national side in Rio de Janeiro in July 1914. The score was 3-3. 90 years later on May 30th 2004, Brazil returned to Exeter for the replay! The match was to celebrate Exeter City's centenary - the score was 0-1 to Brazil. See Exeter in the Great War for how Exeter coped with the Great War. By 1917, the German u-boat blockade of the country was beginning to bite, the Government introduced rationing, and local authorities authorised the use of parks and other land for allotments. 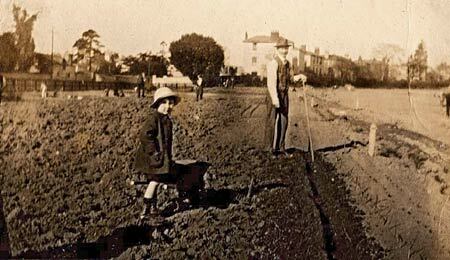 These allotments are believed to be in St Leonard's. The little boy is Ambrose Tucker, who is still going strong at the age of 94. See History of transport in Exeter for more on the trams. 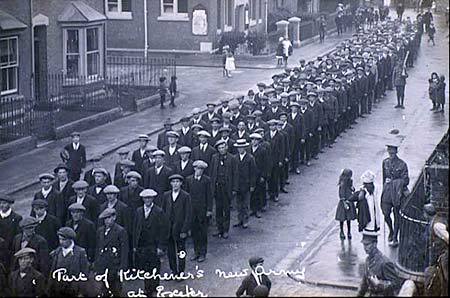 This large column of men have just joined Kitchener' Army, probably in late 1914 or 1915. Still in civilian clothes, they are marching in Church Road, St Thomas, away from the County Ground, where they would have signed up. Cowick Road is middle, top of photo. The railings were removed in World War Two for ammunition. Photo courtesy of Pam Salzmann. The Exeter City, Arsenal and England footballer, Cliff Bastin was born in Heavitree in 1912. 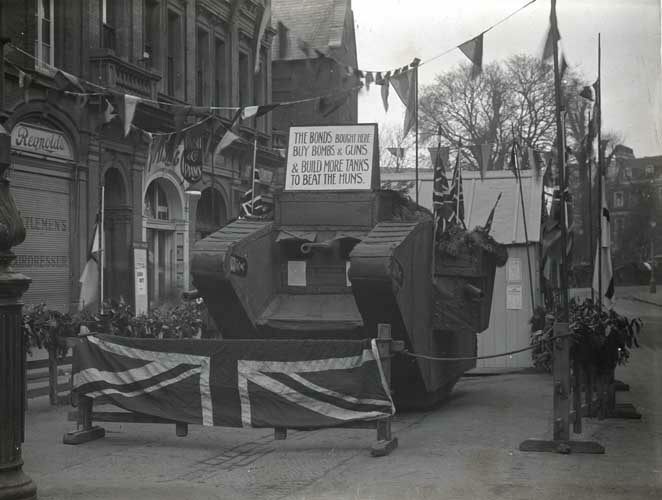 This photo shows the newest weapon in the British armoury on display in Bedford Street in 1917. Colloquially known as a 'Big Willy', the machine was on display to sell War Bonds to pay for "bombs & guns & build more tanks to beat the huns." Photo Mary Hare, courtesy Westcountry Studies Library. In February 1916, an order went out that the streets were to be darkened because of the threat from Zeppelins. This new weapon had terrorised the east coast of England, and rumour and speculation had forced the authorities to act. At the same time, the Council were directed by the Government to print and distribute air raid precaution leaflets, at a cost of £12 3 shillings. However, letters were published in a local newspaper that doubted whether such a raid was possible so far west. Cartoon Devon and Exeter Gazette. In 1914, prices of some commodities immediately went up "potatoes have advanced 3d per stone. Bread and flour will be increased on Monday". In 1917, the City Council announced that an additional ten acres had been acquired for allotments, which would be let to half of the three hundred on the waiting list. The need was greatest in St Thomas and 32 plots were allocated in St Thomas' Pleasure Ground. Photo Western Times. The long lost cafe first opened in Exeter in the premises of the Exeter Bank, next to the Royal Clarence Hotel. The interior, on the left was very ornate, with an intricately plastered ceiling. The building is now Michael Caines Abode Café Bar. 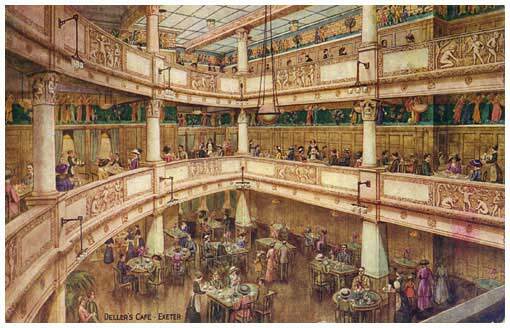 Right is how the new Deller's Cafe looked just after the First World War. 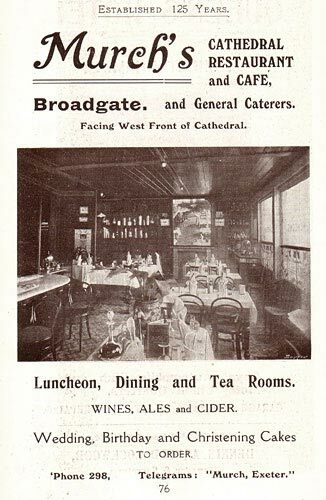 The cafe was built on top of Lloyd's Bank and opened in 1916. It was destroyed in May 1942 during the blitz. Part of the message on the back reads " PS what do you think of this palace. I had tea and supper here". 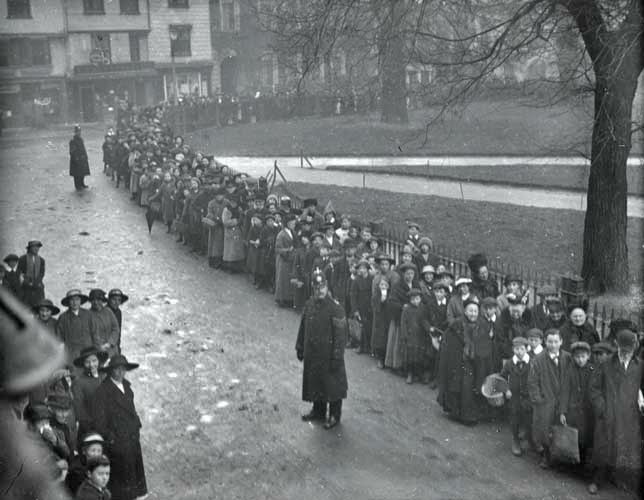 In September 1914, Exeter became the first provincial town to take refugees, when 120 Belgians arrived. By the end of October over 800 had settled. In 1915, a further 3,000 arrived in the city. 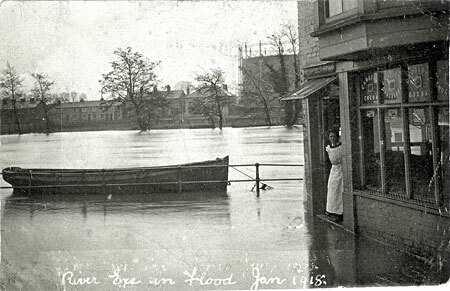 The River Exe flooded on the 16th January 1918. On 19th July 1919, all city schools attended a service at the Cathedral to celebrate Peace, followed by a Victory March through the streets. Thomas Moore, who founded the clothing shop in Fore Street was killed in battle at Zillebeke, France in 1917, at the age of 34. The Exeter Flying Post ceased publication on 21st April 1917. The plant and machinery were auctioned on the 25th April and the office files and records purchased by the Exeter City Library. The Flying Post was first published as the Exeter Evening Post in 1763 from Southgate Street. In 1770 it became the Trewman's Exeter Flying Post. See War Breaks Out for how the Flying Post reported the start of the First World War in August 1914. 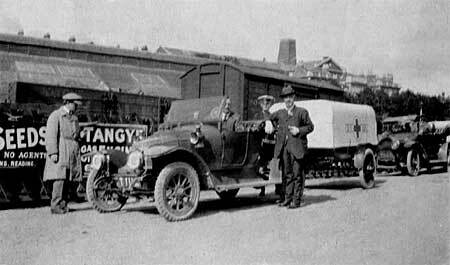 Marks and Spencer opened their second store in Exeter at 259 High Street, in 1919. 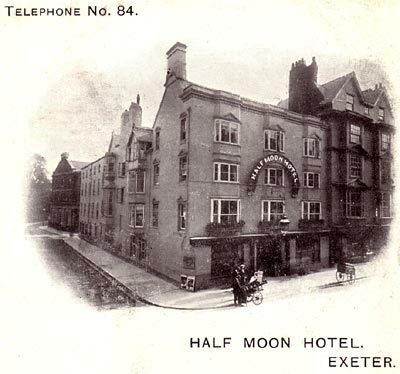 The population of Exeter in 1914 was approximately 48,000. 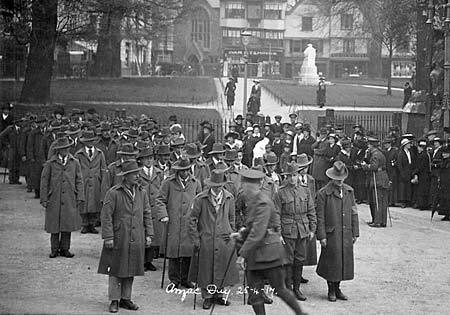 Many Australian and New Zealand troops passed through Exeter, either on the way to the front or returning home. Many were also treated for their wounds at the VA Hospitals around the city. Here, Australian troops assemble to celebrate Anzac Day at the Cathedral. Mols, in the background has a large sign advertising War Etchings. 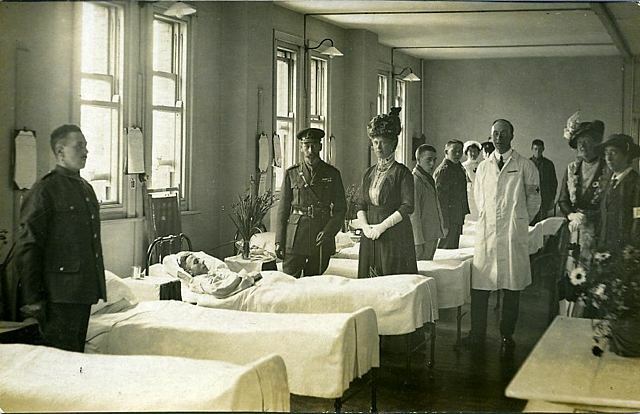 On 8th September 1915, King George V and Queen Mary visited Military Hospital VA No 1, based at the Eye Infirmary. Queen Mary also visited the Castle Street Hostel VA No 5, now Bradninch House. This was the first visit by a monarch to Exeter in a motor car, when four cars were loaned by prominent citizens for the King's use. 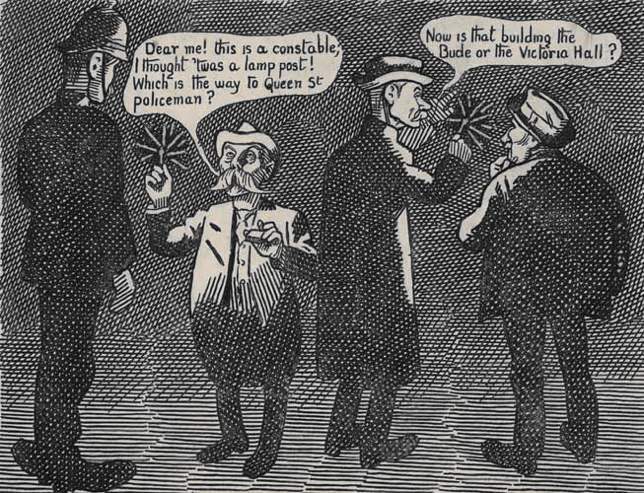 On 26th October 1914 the Express and Echo reported - "there was an unusual number of small cases at the Exeter Police Court, today, a good many of them covering drunkenness among soldiers". A magistrate was quoted as saying - "something would have to be done about the closing of public houses". 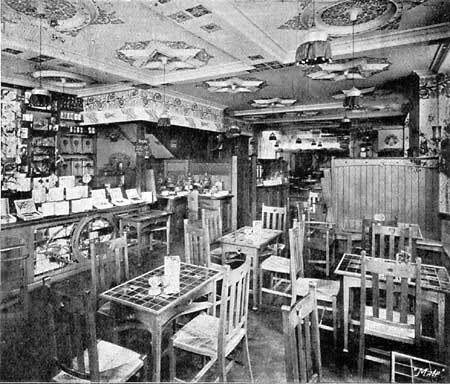 The Government brought in legislation to limit pub opening hours with the Defence of the Realm Act (1914). 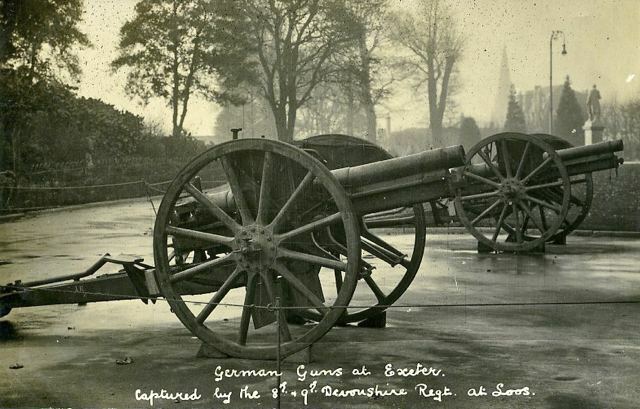 The 8th and 9th Devonshires captured some German guns at the Battle of Loos during September/October 1915. They were brought back to England and put on display in Northernhay Park. The 8th suffered casualties of 19 officers and 619 men killed from machine gun fire - they took the German gun trenches where these guns were presumably captured. By October they held an area 2 miles deep by 4 miles wide, but the attack was not the big push expected by the generals. The death toll from the war cut across every class in the city. The Bishop of Exeter, the Rev. Cecil lost three sons on the Western Front. Randle William Gascoyne Cecil (left top) was the eldest son of Bishop Cecil and Lady Cecil. He wad killed on 1 December 1917, aged 28, at the Battle of Cambrai, serving in the Royal Horse Artillery. Lieutenant Rupert Edward Gascoyne Cecil, Royal Horse Artillery was killed on 15 July 1915 at Ypres. He was the fourth son of the Bishop, and was just 20 when he died. 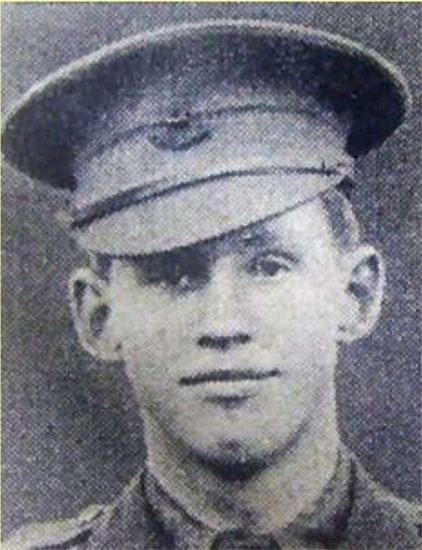 A third son, John Arthur (Jack) was killed, aged 25, in August 1918. 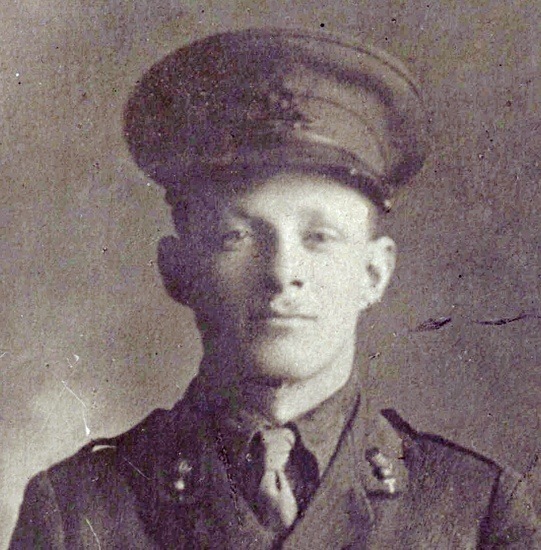 Jack was a Captain in the Royal Horse Artillery, and was awarded the Military Cross in 1918. A fourth son, Victor survived the war. Bishop Cecil's family believe that he never recovered from the loss of three sons. He remained Bishop of Exeter until is death in 1936. Photos Deborah Wilson. The Mayoress, Lady Owen ran the Mayoress's depot for the comfort of the fighting men. 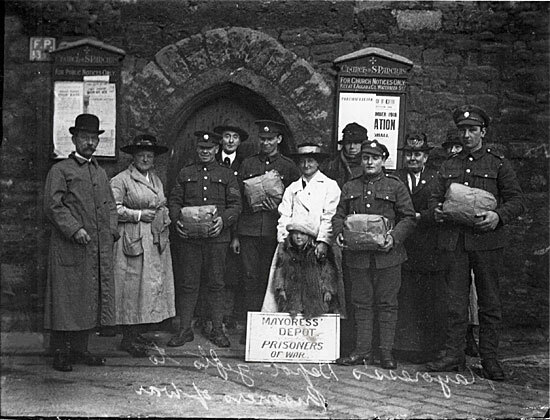 Taken outside St Pancras' Church, the Mayoress, centre, poses with helpers with the gifts for prisoners of war. Lord Rupert Ernest William Gascoyne-Cecil became Bishop of Exeter on 17 November 1916. He was the second son of Prime Minister Lord Salisbury. Educated at Eton and Oxford, he was rector of Hatfield for 28 years before being unexpectedly appointed Bishop of Exeter. He was noted for his tolerance and gained a reputation for eccentricity. The front cover of a ration book stamped October 1918, for Henry Holladay, who ran Garton and King. 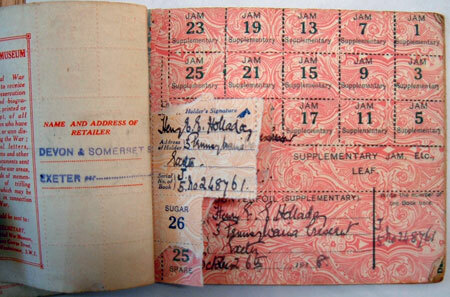 The lower photo shows inside the book which was for use at the Devon and Somerset Stores. It appears that the page contained coupons for jam. 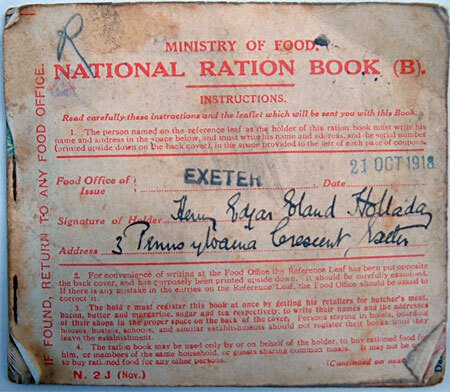 Although rationing was not nearly so extensive as that for the Second War, it was quite extensive in the closing months of 1918, with fines for those who broke the rules. The river froze solid in the winter of 1917. 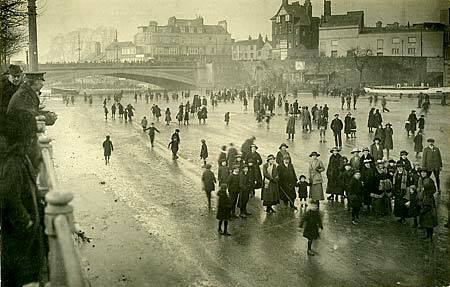 The ice was so thick that it supported 100 people walking on its surface, an ox was roasted on the ice, and people were skating under the Exe Bridge. Someone also managed to ride a bicycle on the ice, between Cowley Bridge and the Fish Quay, no doubt sliding down Blackaller Weir. Flooding was an event that was quite common. The rowing boat is moored on the tow-path at the bottom of Weirfield Road, while a shop girl stands in the doorway of the flooded corner shop. The shop and terraces that were close by have been demolished and replaced with some less densely built housing and gardens. 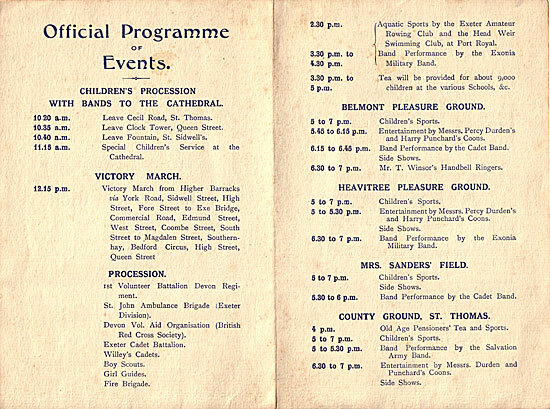 The official City Peace Celebration Programme listed the events that would take place on 19th July 1919. 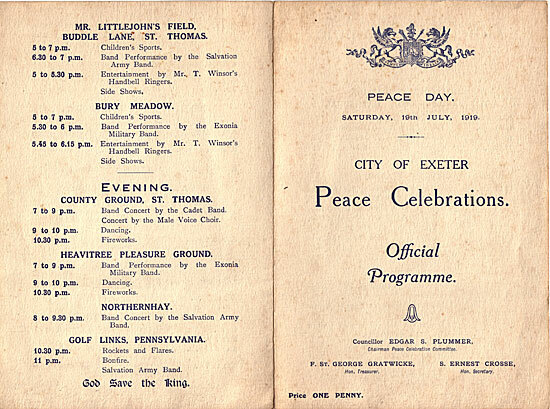 Venues included Buddle Lane, Bury Meadow, the County Ground, Heavitree Pleasure Ground, Northernhay ending with rockets, flares and a bonfire on the golf links at Pennsylvania. Rockets and flares were let off, and this large bonfire set ablaze as 11pm on the golf links at Pennsylvania. The Salvation Army Band accompanied the proceedings. 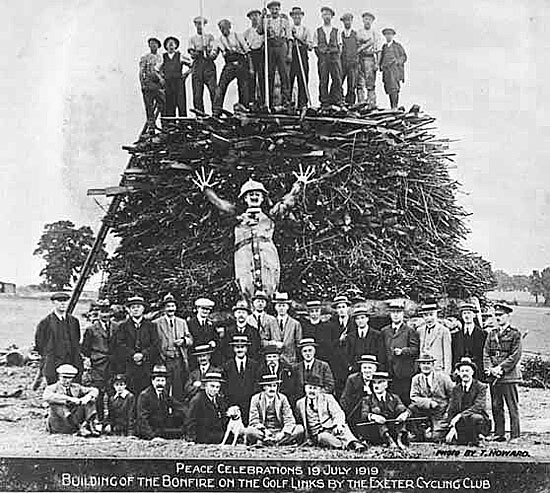 The bonfire was built by the Exeter Cycling Club. After four weary years of bloodshed, citizens welcomed 1919 as a peaceful year. With so many lives lost, numerous people had lost their faith. The weather for Easter 1919 was more like June and many went to the seaside. 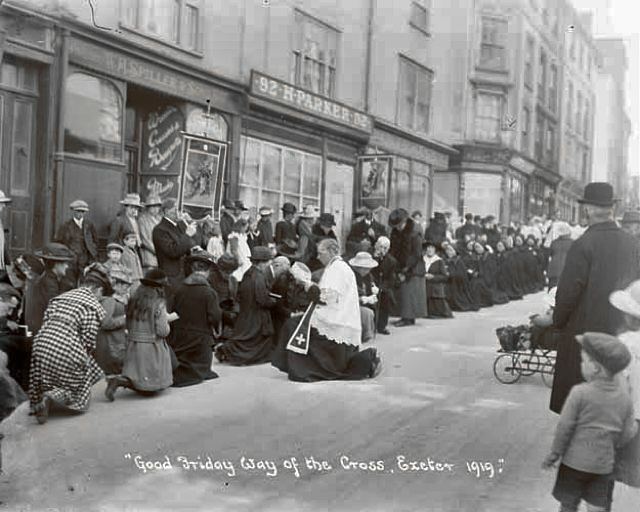 For Catholics, the 'Way of the Cross' procession through town was still performed. 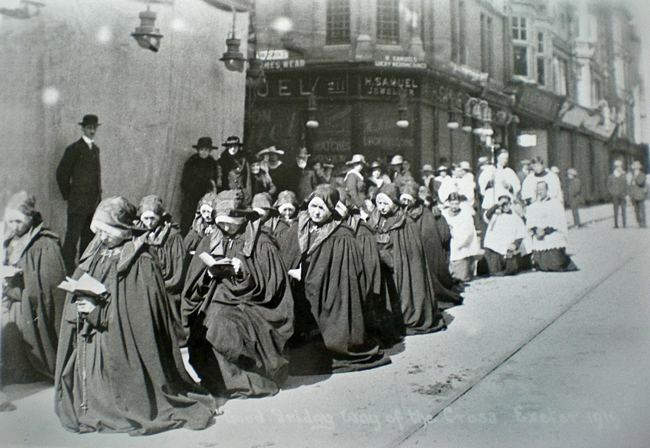 The top photo was taken in South Street, while the lower photo (taken in 1905) shows the nuns, (probably of St Wilfrid's) praying by Goldsmith Street, at the former site of All Hallows Church. These young men were the lucky ones, as they were too young to be called up. Their turn would be in 1939, either called up, or recruited into the Home Guard. 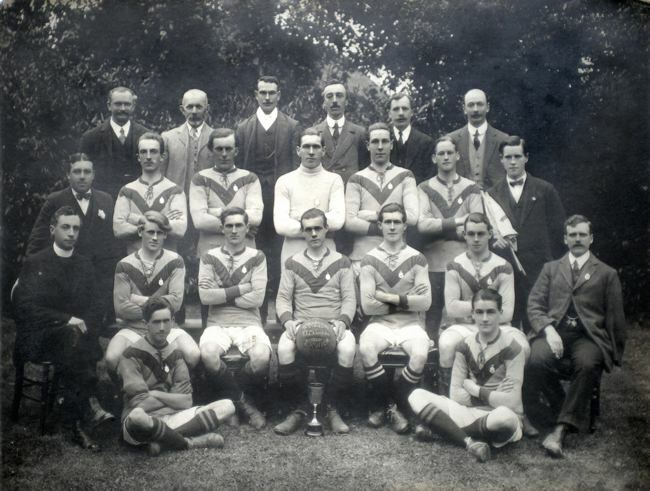 St Andrew's Exwick played in the Youth League and were champions in the 1919/1920 season. 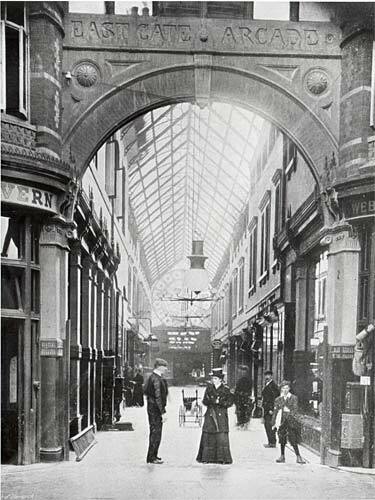 A rare photograph showing the entrance to the Eastgate Arcade from the High Street. The Eastgate Coffee Tavern is on the left. The arcade was locked at night by lowering a gate across the entrance. As the photograph was from the Western Times, it is probable that it is just post 1910. Courtesy the Express and Echo. 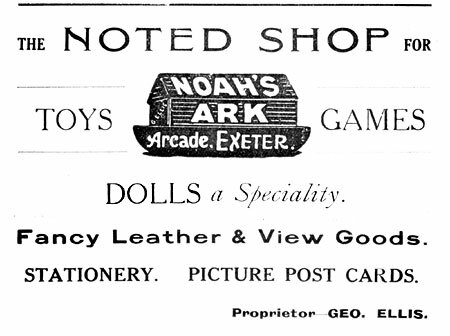 An old, established business that lasted into the 1990's as the Exeter Pram & Toy Shop based in Sidwell Street. 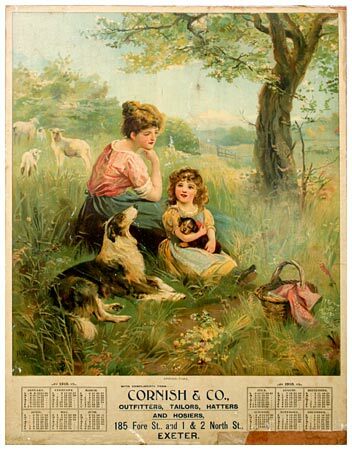 A 1910 display calendar for Cornish and Co of Fore Street. 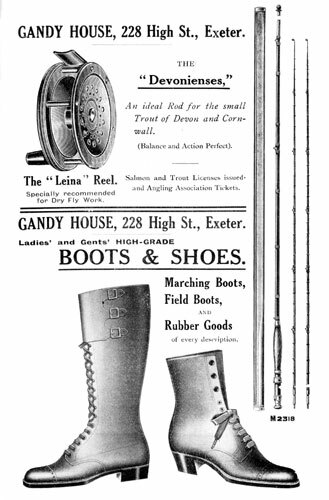 The business moved from Broadgate to Fore Street in 1905. A business that caters for the country class and reflects the rural hinterland of Exeter.